Aarhus-based C.F. Møller, Denmark’s largest architecture firm with branches in Copenhagen, Aalborg, Oslo, Stockholm and London, is perhaps best known for its cultural, educational and, above all, healthcare-oriented projects around the world. Villa U is one of the firm’s lesser-known but equally impressive residential works. Situated in a green, suburban area of Aarhus, Denmark’s second largest city, the 200 sq m two-storey family home revolves around a double-height central space, lit by skylights. A tinted oak and concrete sculptural staircase curls around a floor-to-ceiling brick wall with a built-in fireplace, offering plenty of space to exhibit the family’s private art collection. The house’s main entrance leads into a grand foyer stairwell, which is the villa’s spinal cord. The ground and upper floors are conceived as two rectangular volumes around it, stacked on top of one another. These unusually angled spaces create playful cantilevered triangular niches, which are used as terraces and accessed from the living room downstairs, and master bedroom found on the upper floor. 91 years after renowned Danish architect Christian Frederik Møller set up the architectural office that bears his name, the firm’s original philosophy of seamlessly blending landscape, building design and smaller scale elements is still very much alive. The villa is close to nature, offering striking vistas, which the owners and their guests can take in through floor-to-ceiling windows, framed by dark, patinated zinc. On the ground floor, a living room, a custom-built kitchen and several bedrooms offer direct access to the outside through sliding doors that lead to concrete terraces. Putting yet another of C.F. Møller’s school of thoughts to the test - the ideal of democratic architecture that is accessible to all - the house was designed to be fully accessible to people with disabilities. 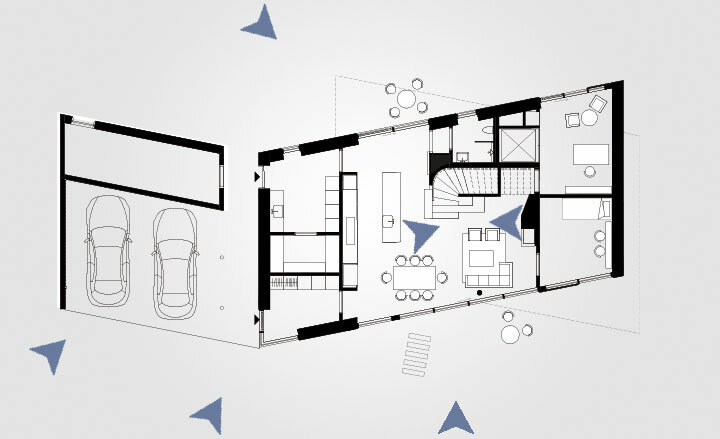 From the integrated carport to the upper floor, all areas of the villa can be reached via wheelchair, aided by a specially built residential elevator.